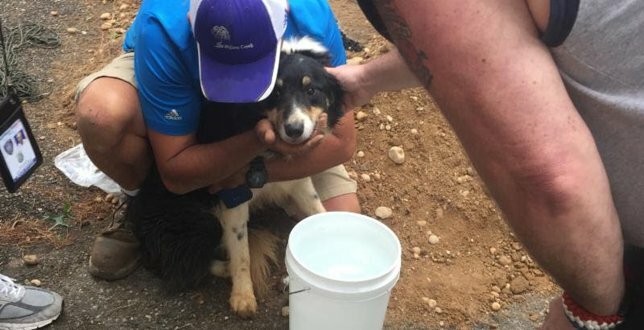 Dog had become stuck in storm drain near golf corse where he lived; collaborative efforts resulted in his successful rescue. James Brown, a missing border collie from the Willow Creek Golf and Country Club in Mt. Sinai, was rescued after falling down a storm drain. Mt. Sinai, NY - July 17, 2017 - On July 10, 2017 an alert was posted on Facebook about a missing border collie at the Willow Creek Golf and Country Club in Mt. Sinai. The dog, James Brown, or affectionately known as JB, had disappeared from the golf course where he lives. On July 15th, 2017 a golfer thought he heard whimpering from a drain cover but he was unable to see JB. One of the workers on the golf course alerted Suffolk SPCA Chief Roy Gross who then contacted Suffolk County Police Emergency Services Unit. The collaborative efforts of the golf course Superintendent, Frank Galasso and his workers, Suffolk County ESU and the Suffolk County SPCA resulted in the successful rescue of JB. JB was rushed to a veterinary clinic who amazingly found him to be in good health despite his lengthy ordeal. This was a happy ending to a story that could have turned out to be tragic. The Suffolk County SPCA is a private, nonprofit, charitable organization and the voice for animals in Suffolk County. We do not receive taxpayer or public funding and we must rely on the support and generosity of donors to exist. Please help us to provide a better life for pets and other animals in Suffolk County. Donations can be mailed to: Suffolk County SPCA, P.O. Box 6100, Hauppauge, NY 11788-0099 or by logging onto our website. 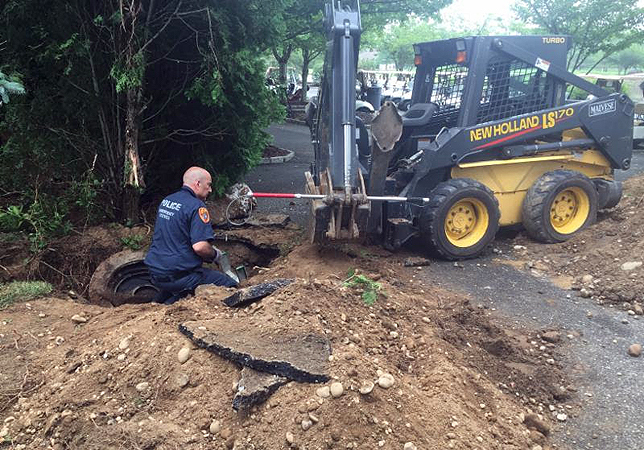 Subject: LongIsland.com - Your Name sent you Article details of "Suffolk SPCA: Missing Border Collie Rescued By Collaborative Efforts After Falling Down Storm Drain"